John Riley reviews Samyang's first AF lens for Canon DSLRs, the Samyang AF 14mm f/2.8 EF wide-angle prime lens. For many years, Samyang has been building an impressive array of manual focus lenses. 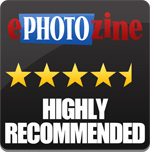 Reviews have been very positive, although often expressing the wish that the lenses were autofocus. More recently, we have seen a gradually expanding range of AF lenses, albeit until now for Sony FE fit. This consisted of the 14mm f/2.8, 35mm f/2.8, 50mm f/1.4 and 35mm f/1.4 FE. Now we have another first, the AF 14mm f/2.8 EF lens for full frame Canon DSLR cameras, the first Samyang AF lens for a DSLR camera system. 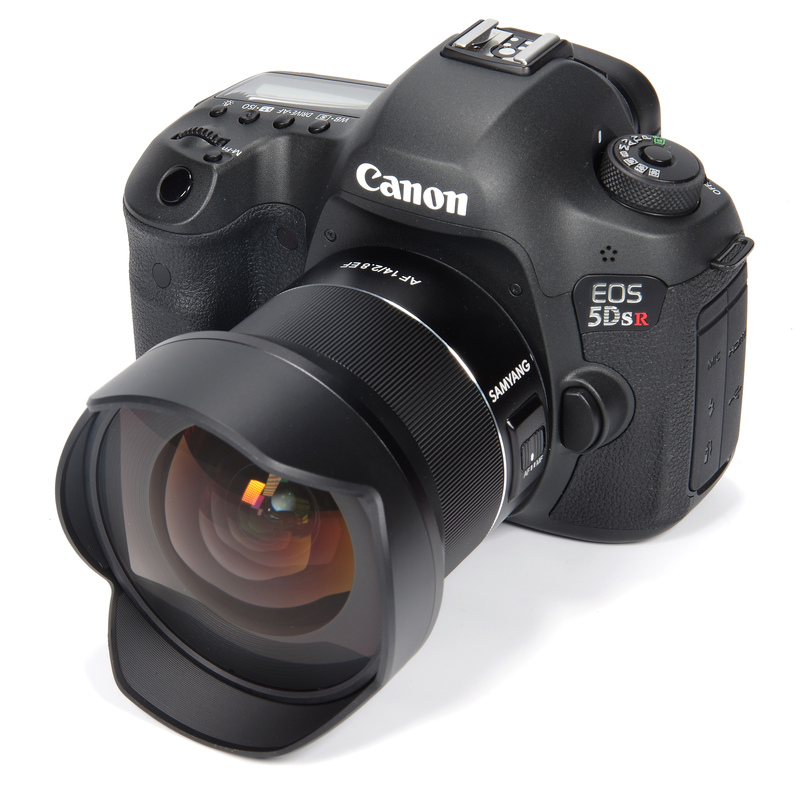 Here we put this new lens to the test, using the Canon EOS 5DS R 50MP camera body. The lens weighs in at a reasonable 485g, without caps, and feels well balanced with the 5DS R camera body. It feels solid without feeling over heavy. The finish is excellent and it looks the part with its huge domed front element all but filling the diameter of the built-in petal lens hood. There is no filter thread, so the hood offers physical protection as well as flare reduction. Peering into the front element we might glimpse the 7 bladed diaphragm, which is controlled from the camera body, there being no aperture ring on the lens. 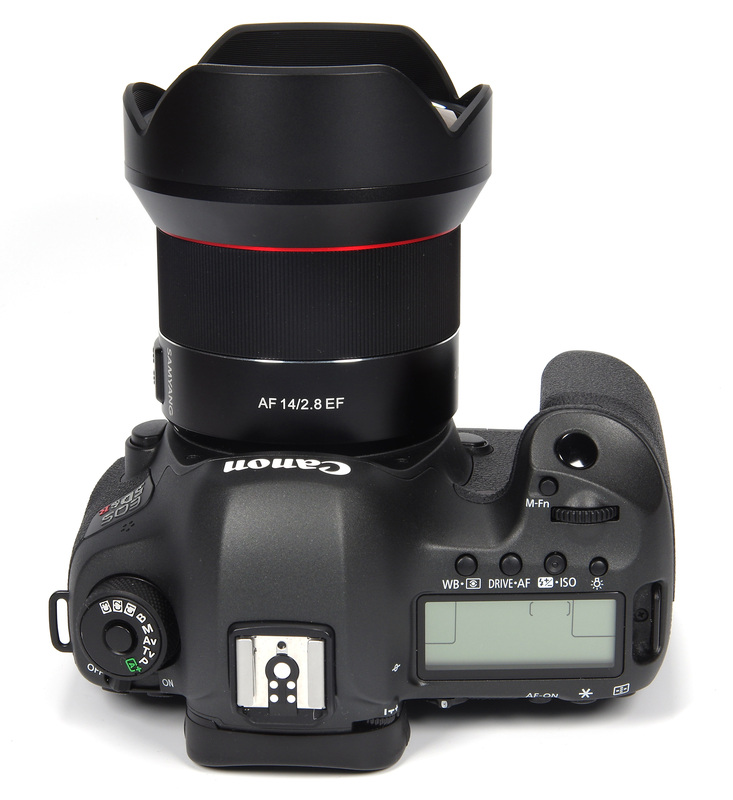 The wide electronic manual focusing ring lies behind the petal hood. Its fine ribbing affords a good grip and the actual tension of the ring is a perfect balance between being smooth in operation and yet not so easy to turn that it can be operated accidentally. This is important because the manual focusing continues to operate in AF mode. This is a great feature for making slight final tweaks to the focus position after AF has locked on. Focusing is down to 0.20m (0.65 feet), representing a maximum magnification of 0.15x. The grip of the hand on the lens is such that there is no tendency to move the focusing ring accidentally. Obviously, this may vary from user to user depending on the size of their hands, but the arrangement does seem well thought out in this respect. The only other adornment on the lens is the AF/MF switch. As the lens is internal focus, it remains the same length regardless of focus position and the grip remains stable on the lens barrel. There is no distance scale provided, and hence no depth of field scale. This is a pity as with an ultra wide prime it could have assisted in finding the hyperfocal distance in landscape work. The lens mount is well engineered and bayonets slickly onto the Canon body. There is no rotational play and the lock is positive and secure. There are the usual electronic contacts that afford communication between lens and body. Lens construction is 15 elements in 10 groups, similar to but not identical with the other 14mm lenses in the Samyang range. There are 2 Aspherical, 4 HR (High Refractive Index) and 1 ED (Extra Low Dispersion) elements to control aberrations. 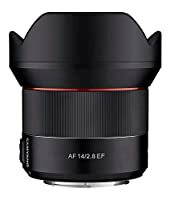 By contrast, Samyang's AF 14mm f/2.8 ED for Sony FE has 14 elements in 10 groups and the manual focus Samyang 14mm f/2.8 ED AS IF UMC has 14 elements in 12 groups. It is interesting that there are these design differences between essentially similar lenses from the same manufacturer. In use, it is hard to fault such a simple and efficient lens. It handles well, focuses swiftly and accurately and produces superb results, all in a compact, weather sealed body. Definitely, a pleasure to use. Looking first at central sharpness, we see an excellent performance from f/2.8 all the way through to f/11. This standard is still very good at f/16 and f/22. The edges start off as good at f/2.8, becoming very good from f/4 to f/16. The edges at f/22 are still good, but diffraction is taking its toll. CA (Chromatic Aberration) is very low centrally and still very well controlled at the edges. Further correction can be undertaken with software if required, but generally, there may be little need to do so. Distortion is -3.10% barrelling, which is certainly very noticeable. Many subjects will stand it as it is though, as we are quite used to looking at barrel distortion in ultra-wide lenses. If required, corrections may be made in software. Flare is generally well controlled, but when the sun is just out of the frame it is certainly possible that various artefacts will be generated. However, this does not result in a total washout of contrast and detail, so might even be used creatively under some circumstances. Bokeh, the quality of the out of focus areas, is probably not the most likely feature for an ultra-wide, but in this case, it is very pleasant and smooth anyway. The overall image quality does have a particularly crisp and detailed “look” to it and the out of focus areas show excellent, smooth gradation. The Samyang AF 14mm f/2.8 EF lens is priced at £649. For Canon users, the obvious alternative is the Samyang 14mm f/2.8 ED AS IF UMC at £329, although this is a manual focus lens. 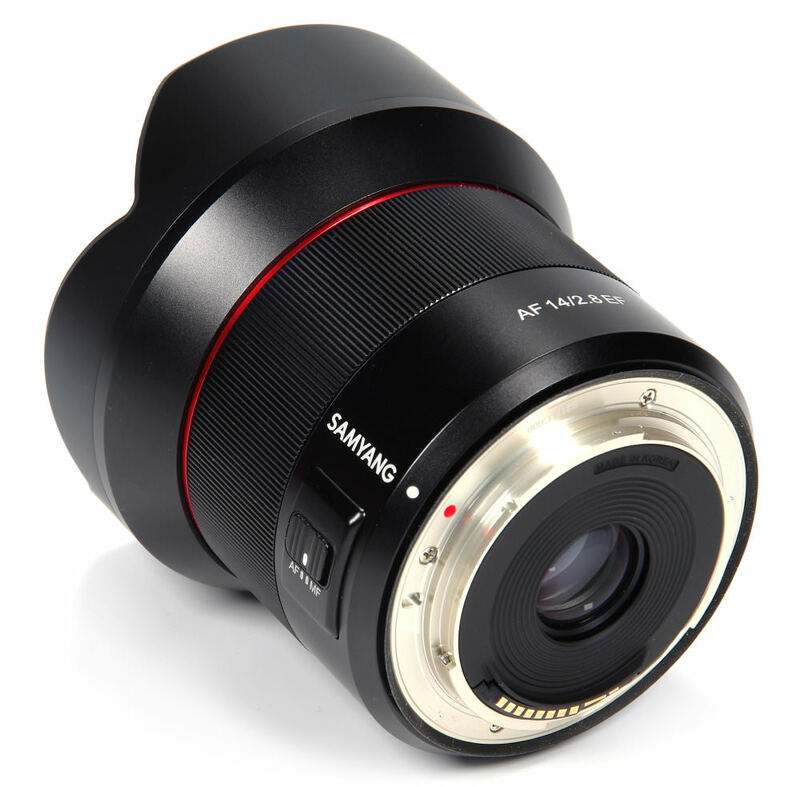 Samyang also offers the Premium 14mm f/2.4 AE XP at £899, also manual focus only. Canon themselves have the EF 14mm f/2.8L II USM priced at £1999. 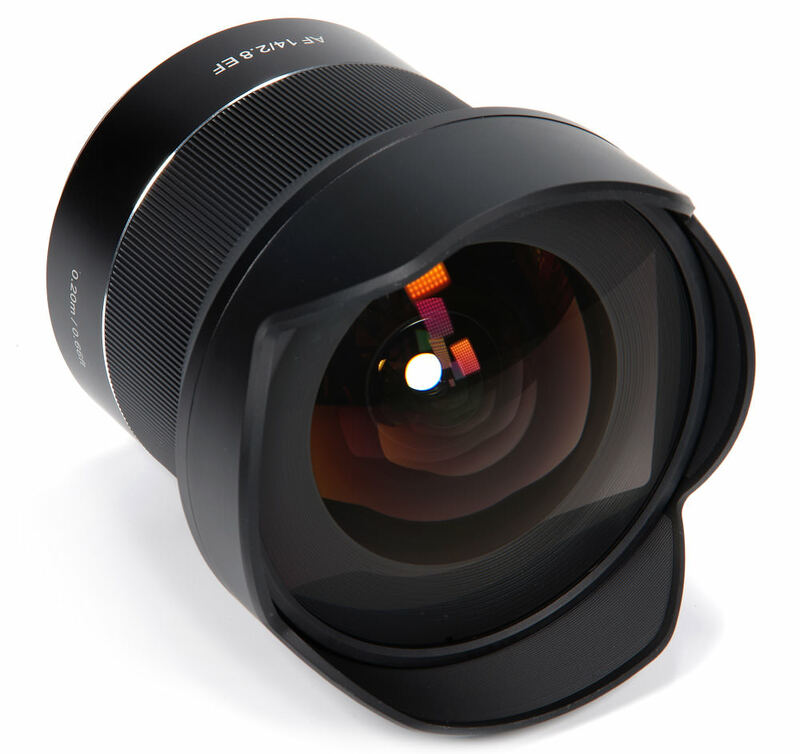 Finally, the Sigma 14mm f/1.8 DG HSM Art lens costs £1679. This leaves the new Samyang lens looking excellent value. For more options have a look at the Top 19 Best Canon EOS lenses, Top 22 Best Samyang Lenses, or have a look at the Top 29 Wide-angle Landscape Lenses. Samyang has consistently produced some excellent lenses for many years and now join the mainstream of AF lenses with equally powerful offerings. Samyang's first AF lens for Canon wins on high quality and ease of use.